Frank has been building his house since 2013, when he began the so-called Palais Récup endeavor. More than just constructing a home out of recycled materials, the project also aims to invent new technologies and new ways of living in cities. It seems like Frank is crafting his house out of second-hand materials almost as a public display of what’s possible for 21st centuries, as if to say that anybody can live a circular lifestyle if he can. Building a massive house out of stuff other people don’t want anymore isn’t as simple doing an eBay search, however. 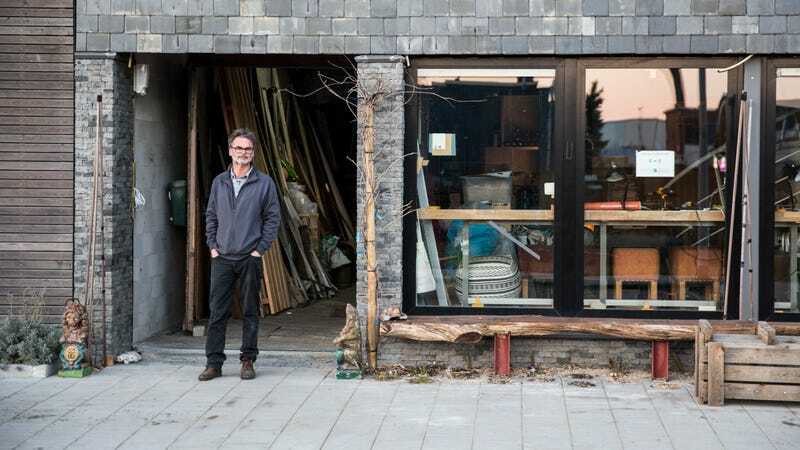 Before he started Palais Récup, Frank was living in Buiksloterham Circulair, a neighborhood in North Amsterdam that serves as a laboratory for sustainable city-building based on circular principles. Construction on Palais Récup began in 2013, and a lot of the initial materials needed to be bought new—things like concrete, lumber, and stones. From there, Frank started searching for the largest furnishings for the house. Frank also showed me a massive cupboard built in the 19th-century. It was filled with all kinds of knickknacks, from family photos to old camera equipment to a handful of cell phones from the late 1990s. It’s a true cabinet of curiosities, one that also happens to serve an important design role in why Palais Récup looks the way it does. This is how the rest of the interior is coming together, too. The overall design could be described as chaotic. Some rooms in the house are still completely unfinished, with sawdust covering the floor and power tools leaning against the walls. But there are elements that look beautifully finished, as well. There’s a set of beautifully engraved French doors, complete with leaded glass details that open out into one of those empty rooms. Up on the roof, there’s a century-old hook, the type that you see on canal-side houses all over Amsterdam. It not only looks charming but it also helps Frank haul up fuel for the furnace and supplies for his rooftop garden. There’s a whole sunroom of storage up there, filled with things waiting to find their home downstairs inside the house. All things told, Frank guesses that about 60 percent of what’s in his house came from eBay. And the items that didn’t come secondhand from eBay are often used to reuse other materials. In his furnace room—Frank calls it his “engine room”—the equipment is designed to recoup energy from the air, the water, and the toilets. There’s also a compost bin—Frank calls it a “hungry bin”—where worms eat up all of the house’s organic waste and produce a premium fertilizer that feeds the plants on the roof. Frank isn’t alone at Palais Récup, either. Behind the main house, the one that’s full of stuff bought on eBay, there’s a second house that Frank rents out to help fund construction on Palais Récup. The apartments looks nice and modern, not unlike what you’d probably see in some of the new developments around Frank’s house. Some of the tenants actually trade services like contracting or design work for rent, which adds an interesting bartering element to the whole experiment. Nevertheless, the arrangement does indicate that there’s still a trade-off when it comes to building a completely sustainable home. Unless they’re rich enough to buy all the eBay goods they want, the average city hacker will need to participate in the traditional economy on their way to truly circular living. But Frank’s statement is loud and clear: together, we can build better cities. Palais Récup is just the start. About a mile from Palais Récup, there’s a whole community of people pursuing circular living in an old shipyard called De Ceuvel. Many of them live in boats that sit on top of polluted soil that they’re trying to clean with special foliage. On a nearby lot, Frank is helping to develop yet another complex of homes for people who want to try out a more sustainable lifestyle. Project-by-project it’s not hard to see how Frank’s advertised job title is starting to make wonderful sense. He is making a city within city. Most of Amsterdam’s residents will continue to live more conventional lives, but Frank is working towards significant changes in how those around him live. Palais Récup is less of an experiment than it is a command center. The city, for Frank, is the lab.